1. To make the pastry, rub the butter into the flour, cocoa and icing sugar in a bowl using your fingertips until you get a breadcrumb effect. Make a well and add the egg yolks. Combine together to form a dough – adding 1-2 tbsp water, if needed. Wrap in cling film and leave to rest in the fridge for 1 hour. 2. Preheat the oven to 180oC, gas mark 4. 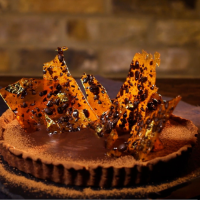 Roll out the pastry on a floured surface and line a 20cm round loose bottomed tart tin. Line with baking parchment and add baking beans or rice. Bake for 15 minutes. Remove the paper and beans and continue to cook for 10 minutes. Allow to cool before removing from the tin. 3. To make the ganache, warm the cream, vanilla, spices and glucose together. Remove from the heat and let it infuse for 10 minutes, and then pour it through a sieve over the melted chocolate. Add the butter and stir gently with a wooden spoon, without over-mixing. Pour into the cool pastry case. Let it set at room temperature if you are going to serve it in the next few hours, if not place in the fridge. 4. For the coffee nougatine, place the sugar and water into a heavy-based saucepan. Bring to the boil and simmer to make a light golden caramel, then stir in the coffee beans. Pour onto a silicone mat or a tray lined with baking parchment. Spread the caramel thinly with a palette knife, and dust some flakes of gold leaf all over. Leave to cool completely, then break into shards and push into the set ganache. Serve the tart at room temperature for the perfect texture. This recipe was first published in Wed Oct 07 12:33:18 BST 2015.